This is a test for Lyme called a Western Blot. It consists of IgG bands and IgM bands. It is run via Labcorp and it is considered to be “self pay” (no insurance). Nutritionally Yours is a Lyme Literate Clinic. If the test is positive we will provide you with a natural protocol to support immune health. We also offer 1 hour phone appointments for people that do not live near our clinic so we can help guide you on ways to help you feel better. We have a medical doctor on staff for people that come into our clinic for those needing medical treatment for illnesses. Standard appointment fees apply. The CDC requires 5 out of 10 bands for a positive test result on the IgG test and 2 out of the 3 bands on the IgM part of the test. 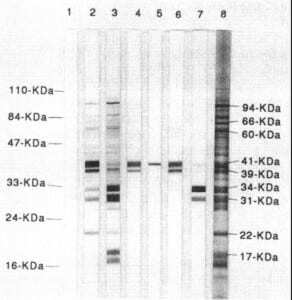 However, because some bands on the Western blot are more significant than others. Lyme symptoms usually start after a bite from an infection tic. The initial symptoms may be flu like with a slight or high fever that lasts 1 day thru a few days. Some people see a bulls-eye type rash and others do not. After the flu like symptoms go away that is when the neurological type symptoms begin. These may include extreme fatigue, brain fog, pain, light and noise sensitivity, trouble walking, headache, feeling unbalanced, body pain, nerve pain especially in the feet. LABCORP: Please go online to labcorp.com and find the closest labcorp location prior to ordering. 2. Go to labcorp.com and find a labcorp close to you. Take the requisition form with you. Do not provide insurance information. This is a self pay order. 3. Results and protocol will be EMAILED to you within 10 days. 1. Great customer service over the phone and via email. 2. Years of experience successfully helping people feel better! 3 Convenient and confidential tests on “your” terms.